Hermione’s Day Off is my second published book. At 8700 words, it’s too small to be a ‘novel’, it’s a ‘novelette’. On planet Bisbane, gender segregation is accepted as normal. Human interference is about to change the status quo. Few cultures take gender inequality to the extent seen on the planet Bisbane. Bisbani women are city dwellers, enjoying high levels of education and technology. Males live in the wilderness, carefully enclosed in fenced preserves. The two sexes only interact when a woman wants a child, and even then she needs a sharp knife. Hermione’s ready for another child. Her first, a son, will soon be relocated to the wilderness. She’s hoping for a daughter, a more permanent family member with whom to share her life. Without the money for a hunting license, however, Hermione can’t access the preserves and hunt a male. Help comes from an unexpected source—a human male hunting a fugitive from off world. The human’s willing to pay for information leading to the criminal’s capture. Although Hermione finds dealing with an alien male distasteful, his money makes a hunting license possible, and his tracking technology makes locating a healthy Bisbani male easy. Even so, Hermione’s not sure she’s doing the right thing, and she might be right. Jimm Grogan’s tale of gender inequality, romance, and reproduction calls to mind the short stories of Robert Heinlein. Also included is a free sample from Grogan’s new novel, Negative Zero. Freebon arrives on the planet Bisbane in search of a fugitive. What he finds is a culture unlike any he’s encountered. Bisbanis practice an extreme form of gender segregation. Women live in technologically advanced cities, while males fend for themselves in fenced wilderness preserves. To breed, women hunt down males, seeking the strongest and healthiest prey. As an alien male, Freebon finds himself viewed as little more than an animal by Bisbani women, which hinders his investigations. 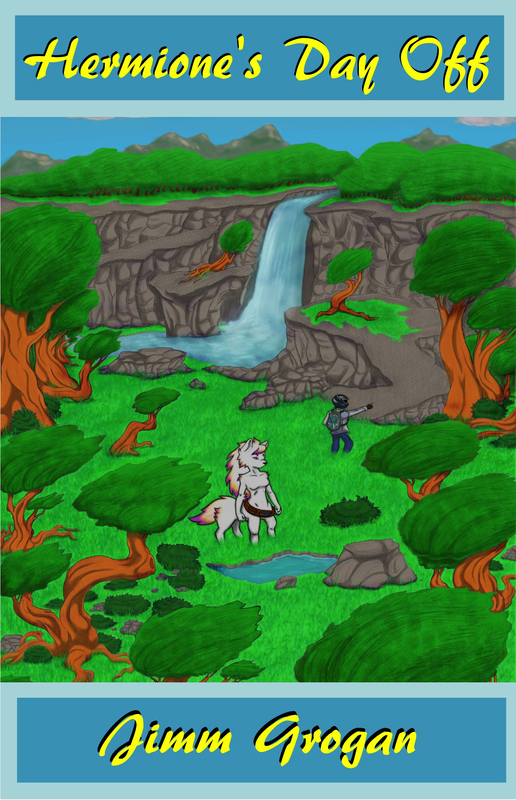 One woman seems willing to provide information, but if Freebon wants her help, he’s going to have to follow her out into the wilderness preserves. Together, they’re about to make an unlikely discovery. An intriguing tale of romance and gender inequality, Hermione’s Day Off includes a preview of Jimm Grogan’s new novel, Negative Zero. Sold as a paperback, audio or kindle book on Amazon.com. Read the first chapter free here. It is available as a nook book from Barnes & Noble, or for free at the iBook store. Also available as an audio book from Audible.com and Apple iTunes. Give me your email address and you can receive the book Hermione’s Day Off as a PDF file for free. That also includes the first chapter of my book Negative Zero. You will also receive my newsletter (once a month or less often) with news about my fiction and related topics. Submit the form below.